My name is Anne and I have owned a dedicated pool for swimming dogs since 1992. Based in Preston, Lancashire, I had the pool built after one of my own dogs ruptured his cruciate ligament. I was in the fortunate position of having an out-building large enough for my new venture, and back in those days it was almost impossible to find a dog pool suiting the needs of a fairly large injured animal. 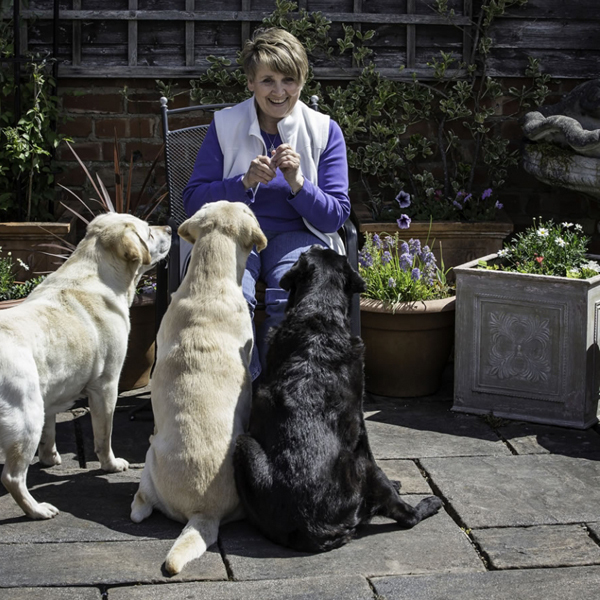 I have several Labradors of various ages and I have always supported Labrador Rescue organisations, both by fund-raising and also in practical ways by offering therapeutic treatments for some of the rescued dogs in need. Apart from the dogs who live here at Teazledown with me I have joint ownership of my sister’s dogs. We think that having joint responsibility gives the dogs added protection and security, should either of us become unable to look after them, for whatever reason. So in theory I own about 15 dogs! Both my nieces have dogs too – Charlotte has Italian Spinone (co-owned with her dad, Richard) and Jo has Bichon Frise and a Mexican Hairless; we are all involved in showing, agility, training, and other dog-related things. My original training was as a specialist PE teacher for ages 5 -19 and my particular interests (and highest grades!) were in swimming, mechanics of movement, and in physiology and anatomy. In fact my second teaching subject was biology, so it was a good combination of subject interests. I started showing my first Labrador in 1981 and success in the show ring led to an interest in judging. It was fascinating to start analysing the gait of dogs, because I had been recognising that of humans for 10 years! I still identify people who may be too far away to recognise by the way they walk, or their posture, and it is the same with dogs. Still wanting to further my knowledge I took an Open University degree, and although almost all the modules were in the area of science I was still awarded a B.A. rather then a BSc. because at the time it was all the O.U. offered. A few years ago I undertook a Diploma course in Canine Massage and was delighted to earn a Distinction at each of the 3 levels. Again, it was initially for the benefit of my own dogs but it has gradually become an integral part of the therapies we can do here at Canine Therapies, and is of huge benefit when we can use underwater massage for some dogs. Various like-minded friends have helped with the dogs for quite a while but I took on additional qualified staff when it became clear I could not manage the pool on my own, and their enthusiasm encouraged me to further my own training (and theirs) by pursuing additional courses about various conditions which we were being asked to treat in greater numbers. We now have 3 fully trained hydrotherapists who have additional skills and knowledge to complement our work.